Below, we shed light on one of the customer-oriented improvements that can be easily leveraged by merchants. If you sell high-quality products, and we are sure you do, satisfied customers will probably want to leave reviews, so you should be ready to get the most out of this wish. What is also important to note is that most of the shoppers trust online reviews as much as they rely on personal recommendations. 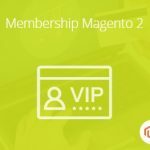 If Magento 2 rating is not available on your storefront or the existing Magento 2 product reviews feature is not good enough, you came to the right place. Simply install the Mageworx Product Reviews & Ratings Magento 2 extension to maximize the potential of customer reviews on your Magento web store and build a reliable rating system. The module improves default Magento product review functionality in different ways, adding multiple functions both for customers and admin users. With the Product Reviews & Ratings extension, you can easily encourage your customers to leave reviews, evaluate reviews from other shoppers, and more. Adding plenty of useful product reviews to your store reinforces your product pages and provides the better user experience. The Magento 2 reviews and rating extension allows you to add advanced product reviews and ratings to your website product pages. The module drastically enhances the default Magento product reviews and rating functionality. Utilizing the rich set of the extension’s features, you will collect feedback from more customers without much effort and increase trust to your ecommerce brand. Let’s have a closer look at how the extension helps you attract more reviewers. First of all, there are three review types: verified, helpful, and top-rated. “Verified” mark is assigned to the reviews submitted by confirmed buyers, while the most helpful reviews appear at the top of the Reviews tab. Besides, Product Reviews & Ratings for Magento 2 adds review filters. Your website visitors can conveniently filter all reviews to see only the five-star reviews or one-star reviews to identify the product’s strengths and weaknesses. The module also provides the ability to specify pros and cons of each product, and send automatic email notifications that will encourage buyers to share their impressions from shopping on your web store. Email alerts can rapidly increase the volume of product reviews, which is especially valuable if you have just launched your store. Moreover, with the Product Reviews & Ratings extension, you can offer discount coupons in review reminder emails. You can also decide whether to send review requests automatically or manually. The Mageworx reviews and rating extension introduces reviews rating system, classifying reviews as Very Good, Excellent, Poor, and more. 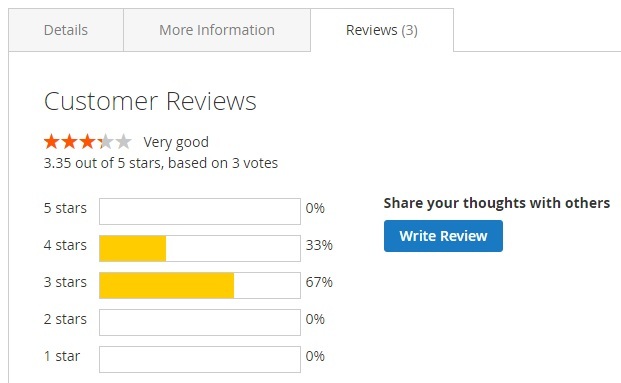 When writing a review, customers can also see what each rating means. Besides, Mageworx Product Reviews & Ratings allows showing rating percentages. A ratio of all review types is visualized on a Star Rating Graph. Another great addition is that customers can see the number of votes on which a product rating is based. It makes sense since the five-star score based on one vote is not the same as a five-star rating based on 300 votes. Moreover, you can place an extra “Write Review” button at the top of the Reviews tab, thus increasing the chances of visitors leaving reviews for your products. You can also let customers write reviews anonymously and attach images to them. As for the interaction with reviews left by other customers, the extension provides the ability to vote reviews as helpful or unhelpful, filter them by rating, as well as report spammy or offensive reviews. As for the admin functions, it is possible to reply to customer reviews from the backend. Let’s dive deeper into the extension’s backend to find out how Mageworx Product Reviews & Ratings can be managed in the Magento Admin. To manage existing reviews and create new ones, first of all, go to Marketing → User Content → Reviews. Here you will find a grid with all reviews. You can see review ID, date of creation, status, a title with a part of the text, a nickname of a reviewer, a review itself, type of a reviewer (Guest, Customer, Administrator), as well as appropriate product and its SKU. Note that it is possible to add new reviews or edit the existing ones on this page. As for the routine optimization, the Mageworx Product Reviews & Ratings Magento 2 extension allows you to delete reviews in bulk. Another available mass action lets you change several review statuses simultaneously. 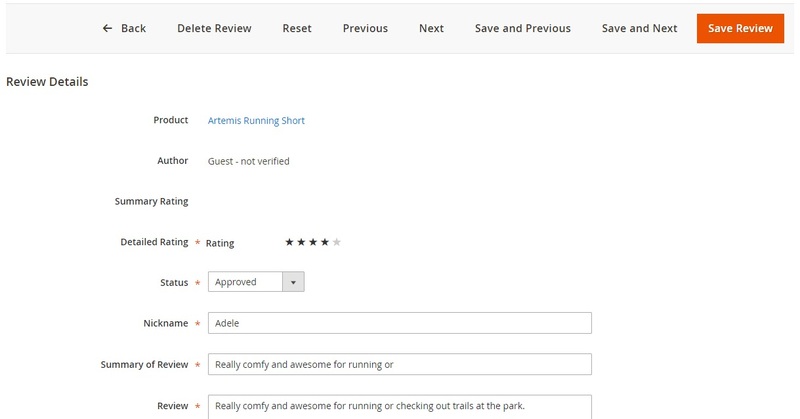 Admin users can edit product reviews in the backend. It can be handy if, for instance, you need to correct a typo or a grammar mistake. While editing a review, you can change its status (Approved, Pending, Not Approved), as well as reviewer’s nickname, review summary, and text. The Magento 2 reviews and rating extension offers such fields as “What I like about this product” and “What I dislike about this product” that can also be edited. In this way, you can specify product pros and cons in the same way as customers do on the frontend. Besides, here you can see all the upvotes, downvotes, and abuse reports submitted for this review, as well as an uploaded image. Furthermore, you can add a Review Comment and send it to a customer. The same options are available when you add a new review. Note that when you create a review, you will be forwarded to the product grid, where it is necessary to choose a product to create a review for. Another important aspect of the Magento 2 product review extension is related to reports which can be found under Reports → Reviews → By Customers / By Products. In Reviews by Products, you can see the grid that displays products and corresponding reviews statistics. Note that there is the “Show Reviews” link in the grid related to each product. It leads to another grid with all reviews about the product. All reviews can be exported via CSV or XML. In Reviews by Customers, the grid displays the number of reviews related to each customer. You can view them on a separate page as well. As for the general configuration settings, you can find them under Stores → Settings → Configuration → Aitoc Extensions → Review Booster. In the General Settings tab, you can configure review reminders, choosing the Email Sender, Email Template, and Customer Groups. To send emails automatically, select Yes in the relevant setting. Here you can also set the Delay Period in days, after which these emails should be sent (e.g., 25 days after the purchase). In Discount Settings, you can decide whether to offer discounts in email notifications sent to customers, as well as discount percentage and validity period. With the Mageworx product reviews extension, you can also enable notifications for admins and specify the email recipient. The last tab of the main extension settings is Review Settings, where you enable or disable image upload for reviews. Now, let’s have a look at the frontend part of the Mageworx Product Reviews & Ratings Magento 2 module. 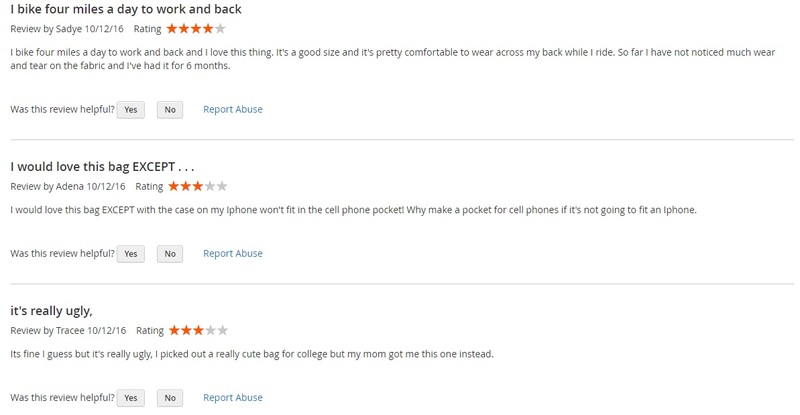 On each product page, the Reviews section gets many new elements. There is a visual illustration of each point provided by this Magento 2 customer reviews extension, as well as the verbal definition, like Excellent, Very Good, Average, Poor, or Terrible. Besides, you can see the overall rating of the product and the number of votes. On the right, there is a “Write Review” button that leads to the appropriate block of the Reviews section. 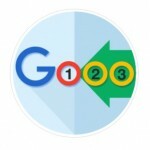 As for customer reviews (the next block of the Reviews section), it is possible to vote for each review as helpful or unhelpful, as well as report abuse. The last block allows you to submit a review. 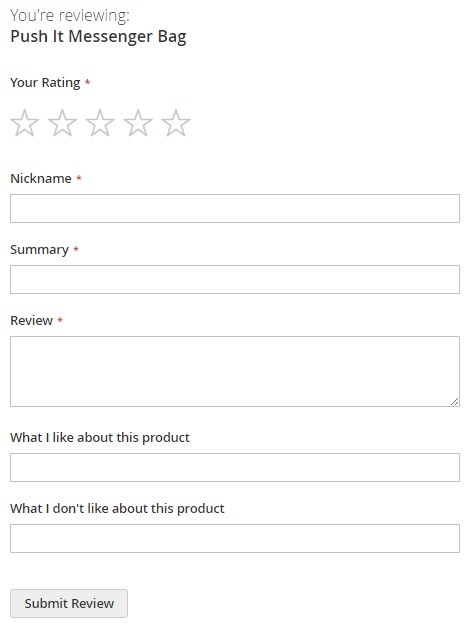 It is possible to specify rating, nickname, summary, the review itself, as well as product’s pros and cons in the following fields: “What I like about this product” and “What I don’t like about this product”. The Mageworx Product Reviews & Ratings Magento 2 extension is designed to make the default review and rating system more helpful and customer-friendly. As a store administrator, you get an excellent opportunity to manage all comments, as well as create your own from the backend. As a result, your Magento 2 storefront will get a more professional look. As for the price of the module, it is just $125.